It was the opening day of the Start-Up week and guess who was presenting? Black San Diego. Amongst a room engulfed with techies of varied cultures, races and backgrounds, we were the chosen group. The conversation was seamlessly moderated by inclusion advocate, Luis Martinez. (centered) Martinez suggested filling the room with a presence that resembled Wakanda. A room where people wearing colorful clothing, exhibit vibrant energy and most importantly, a room occupied with Black faces. BSD, with three founders, Olivia Green (left) Tinicia Smith (right) and not in attendance Sheri Hopkins, had the opportunity to convey their story of creating a business based solely on creating a Facebook group page along with the successes, trials and tribulations that came along with the journey. Audience members listened as they shed light on the adversities that tag along with the title, Black Owned. “Though there are some setbacks in the Black Owned business sector, we have held steadfast in our original vision of our company which is, to promote Black-owned businesses, entrepreneurs, and professionals in San Diego in order to empower our community,” says BSD. Social media, Facebook in particular, has opened the conversation for over 13,000 members to have access to a continuously growing list of Black-owned businesses throughout San Diego County. 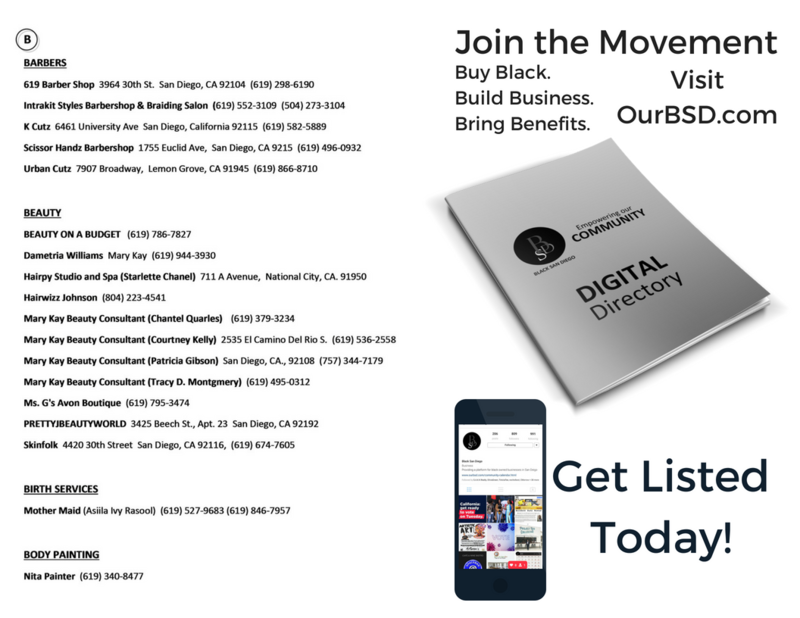 As a response to the growing number of Facebook members being added to the page daily, Black San Diego has expanded its reach as an online presence with the release of the website, ourbsd.com. The idea behind adding a website allows an even larger community to gain access to our individual bios, digital directory, community calendar, and most recently the preferred list of businesses which we recommend. The mere mention of said website sparked a delightful response from the audience members in the startup crowd. Suggestions, comments, and questions began to pour in, like you should include a google map feature, How do you make money? Is everyone included? The general consensus was that they loved seeing a face that resembles my own. We set out to promote Black-owned businesses which is why the latter statement is an absolute favorite of ours. We will continue to DO GOOD WORK while unapologetically promoting Black-owned businesses. We look forward to sparking a Wakanda°ish essence to the future of Start- Up Week. More Black faces, brightly colored clothing, topped off with positive energy.